Palos Verdes Estates municipal government has been hijacked politically by Tony Dahlerbruch, Christi Hogin and Sheri Repp Loadsman; fortunately, George Bird is long and permanently gone. Our city, in which none of them actually resides, has become a science fair laboratory for them to implement their liberal, anti-resident social biases and world views. What makes this most appalling is that this damage is being inflicted upon the precisely wrong subjects: people who moved to and live here in no small part for PVE’s longstanding (pre-Dahlerbruch) conservative bedroom community culture. 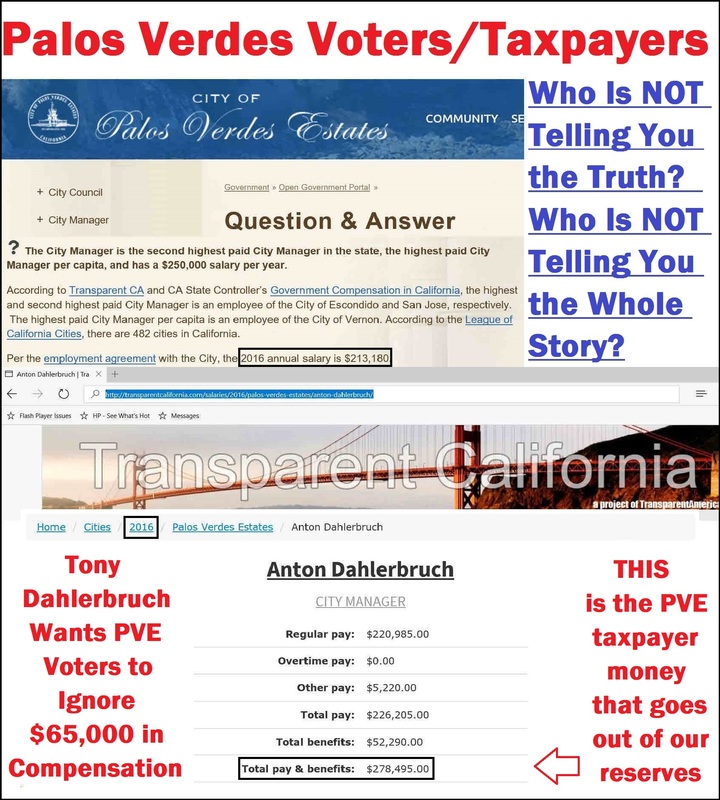 The fact that this conflict persists between Dahlerbruch’s personal views and those of the PVE taxpayers paying his $250,000+/year compensation indicates an enormous chasm in the condoning PVE City Council’s ability to comprehend or care. CORRUPTION AT ITS SOUTHBAY WORST: PVE residents may be shocked by how our sadly under-qualified City Manager Tony Dahlerbruch mis-qualifies himself, his friend City Attorney Christi Hogin, and the Palos Verdes Police Department under John Eberhard as “acting in good faith” and “discharging of [their] duties appropriately.” Apparently, satisfying the inconceivably low ethical and legal standards seemingly set by Tony Dahlerbruch, John Eberhard, and Jeff Kepley may be met while overseeing, directing or condoning both police misconduct (with one officer already having sustained two counts of misconduct) and selective and non-enforcement of the Palos Verdes Estates Municipal Code and Deeds of the City of Palos Verdes Estates (see below). The unacceptable behavior that Tony Dahlerbruch’s predecessor in the City Manager role found worthy of outrage actually passes for good form under Dahlerbruch’s breach of fiduciary duty to all PVE residents. * PVEPD Proven & Admitted Misconduct – Dahlerbruch in 2013 mis-qualified the corrupt acts as those of officers “acting in good faith” and “discharging of [their] duties appropriately.” Later in 2016, Dahlerbruch was humiliated through an Los Angeles Times expose to have mis-qualified the Bay Boys as “urban legend” after they offered him a beer to drink illegally on the shore of Lunada Bay. Click here for details on PVE Police Department Wall of Shame. * PVE Deeds Violation by Ultra Vires Sale of City Parkland – Dahlerbruch in 2013-2016, despite a California judge’s harsh criticism of his or Christi Hogin’s illegal or invalid actions, persists in attempting to sell our very own city parkland to a private citizen, himself with a long track record of illegal land-based acts of which Dahlerbruch was fully aware (see below). * Greedy Power Grab from PVE Mayor – Dahlerbuch in 2015 submitted for approval a detailed report in which the City Mayor is subjugated down to a ceremonial role, with various related powers being uploaded to Dahlerbuch himself. Click to: John on Dahlerbruch & PVE City Council. * Intentional Mislabeling of Property Line to Illegally Shield City from Building Officer Negligence/Malfeasance or Kick Back: click here for details on Mike Ross’s and Allan Rigg’s building code related corrupt acts as supported by Tony Dahlerbruch. Citizens for Enforcement of Parkland Covenants/John Harbison vs. City of Palos Verdes Estates et. al. : To say that Judge Barbara Meiers was “astonished, to put it mildly” by the corruption of Tony Dahlerbruch’s city government in California Superior Court Case No. BS 142768 (click hyperlink for ruling) would indeed be putting it mildly. In her June 26, 2015 legal opinion, Meiers found that Dahlerbruch and Hogin were fighting PVE’s very own property owners to defend illegal or invalid (ultra vires) acts by the City, and in doing so were squandering an estimated hundreds of thousands of our own tax dollars in no small part to pay Christi Hogin’s law firm, which was the architect of the illegal acts in the first place. The City was found by Judge Meiers to be “aiding and abetting” illegal or invalid (ultra vires) acts, with Tony Dahlerbruch persisting literally for years in spending a small fortune of our tax dollars to defend these improprieties. Moreover, this misconduct was supported publicly and loudly by George Bird (click hyperlink and also this link‘s court filing Page 5), whose involvement in PVE politics fortunately has been terminated (but not before he played a major role in getting the City into this mess). PVE Police Misconduct is “Appropriate” Per Dahlerbruch? The evidence of corruption and negligence against this non-resident but City Manager of Palos Verdes Estates in just his first two years as City Manager is mounting, including his aforementioned mishandling of PVE Police Department misconduct. This police misconduct occurred under former Chief of Police John Eberhard (employment now terminated) and involved Officer Hazel Menendez (her police misconduct the subject of Internal Affairs Investigation # 12-004 conducted by Sgt. Steve Barber, concluding with two counts against her sustained, but shockingly she remains employed by PVEPD), Detective Aaron Belda and Sgt. Erick Gaunt. Discrimination, Selective and Non-Enforcement of Laws is “Appropriate” Per Dahlerbruch? Furthermore, Dahlerbruch perpetuates his encouragement of discriminatory, selective and non-enforcement of City laws or ordinances, while reported management ineptitude has led to varying levels of staff and PVE City Council disenchantment. Not only does it appear that Tony Dahlerbruch condones such “appropriate discharge of duties,” but reports from insiders coming into the Coalition indicate Dahlerbruch is directing such improper activities, utilizing subordinates such as terminated City Engineer Allan Rigg and terminated Building Official Mike Ross. Michele & Katie Dahlerbruch – happier days before they were informed of Tony’s corrupt acts vs. PVE residents? 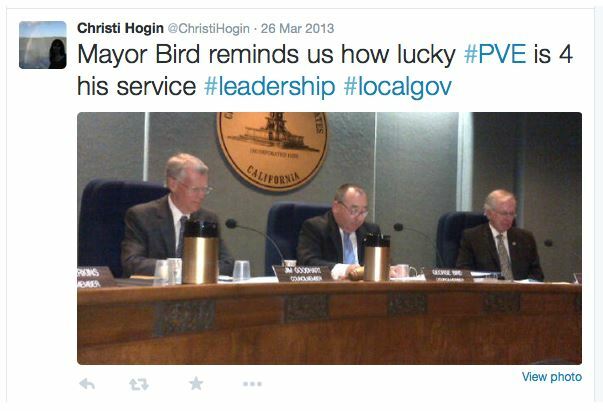 how her father and City Attorney Christi Hogin victimized PVE residents through two years of astoundingly cruel litigation – will Katie Dahlerbruch see him for the man that PVE residents have come to despise? I pray this is not the case. NEGLIGENCE: def. – Conduct that falls below the standards of behavior established by law for the protection of others against unreasonable risk of harm. A person has acted negligently if he or she has departed from the conduct expected of a reasonably prudent person acting under similar circumstances FALSIFICATION: def. – the act of altering (information or evidence) so as to mislead ULTRA VIRES: def. – a Latin phrase meaning “beyond the powers”. If an act requires legal authority and it is done with such authority, it is characterised in law as intra vires (“within the powers”). If it is done without such authority, it is ultra vires. Acts that are intra vires may equivalently be termed “valid” and those that are ultra vires “invalid”. This web page and related posts and commentary represent both facts and opinions of the Coalition to Save PVE from Tony Dahlerbruch, himself, George Bird and the PVE City Council public figures, as protected by the First Amendment to the U.S. Constitution. Comments made by third parties represent their own representations of facts and own opinions. The heat is coming down hard on Tony Dahlerbruch in PVE. All over Nextdoor.com people are demanding his replacement. Incompetence never has run so deep. Not surprising at all, the total and absolute disrespect the Palos Verdes please department shows its citizens is unbelievable and quite frankly unprofessional on so many levels , not to mention completely unacceptable. You are right about the apathy I see it everywhere, I really don’t know what it takes to get people motivated so that the city and the people who we pay to do city business for we the taxpayer are held accountable in a fair and transparent manor. Thanks for the video of the sobriety checkpoint. Institutionalized corruption in such a small is extremely difficult to come back and overcome without widespread support. So do we have anybody or people in any significant numbers to begin the process of addressing each and everyone of these, and I don’t mean the sobriety he checkpoint video alone, i’m referring to the totality of the corruption on seemingly every level of our city government. What is maybe the most disgusting thing about Katie Dahlerbruch’s bigtime adventure at the DUI checkpoint is that she had the vine up online for almost THREE F’N YEARS, and then only took it down when Daddy made her do it. So, folks, she seems to have been real, real, real proud of her big time surviving a drunk driving checkpoint. What a piece of trash! toni – Well, George B and Tony D have more than just one problem in any attempt to maliciously prosecute their detractors on this site, or elsewhere. First, all statements on this site are either factually true or expressions of opinion protected by the 1st Amendment to the U.S. Constitution. Second, by now Tony has been educated for what SLAPP is an acronym (click here). Lastly, the site makes explicitly clear that anyone may submit a complaint if he/she believes a statement herein is factually incorrect, or any other matter is illegal, in order to have it removed or rectified. Only in one case, when Tony Dahlerbruch had his daughter obtain copyright from Sarah Maslauski to a publicly available photo of Katie Dahlerbruch apparently screaming mouth widely agape into a camera, was there a claim of legal impropriety made; within one business day, the photo was removed from the site, which had no reason to learn of the recent copyrighting of the photo. Should Tony D or anyone else attempt to maliciously prosecute the site, plaintiff can expect countersuit and an appropriately broad scope and depth of legal discovery by defendant (and then plaintiff). That discovery reasonably may entail learning relevant aspects of Katie Dahlerbruch’s potential drinking/driving history at UCLA and elsewhere, and may result in obtaining written or other communications between Katie Dahlerbruch and her father, both unprotected by any privilege. What a total P.o.S. is this PVE City Manager. Why can’t he just leave our city and go back to Beverly Hills or retire in Rancho with his disgusting wife Michele? This is so preposterous as to be considered fantasy. “Authority given to Mr. Harbison and a private group” and “no other residents have this discretionary right”? The non-Harbison residents should be thrilled to have Harbison, charging nothing for his services, making sure parkland remains 100% public and not privately owned or used. Why would any resident be anything but thrilled to have Harbison doing nothing more than enforcing the deeds that Tony D and his cronies are refusing to enforce themselves?!? Do they actually think we buy the “we are protecting residents’ rights” nonsense? They are protecting their own egos and powers at City Hall, and not a single thing for anyone outside that building. 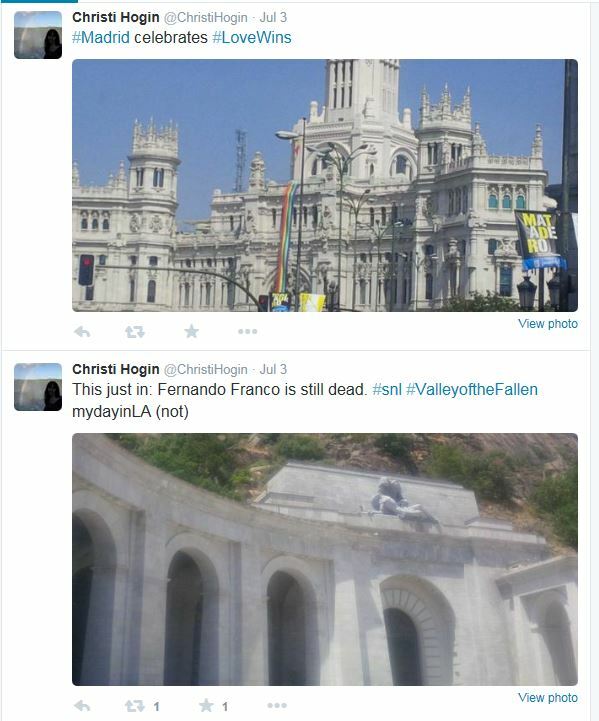 I am still shaking my head at the inanity that the City posted yesterday. It wasn’t even a good ol’ college try. Moreover, in the hypothetical that the “Harbison Gang” did compel the removal of structures from parkland, why would that not be good for the residents? Explain to me please why any honest resident would say, “No, I don’t want the deeds restricting private structures on parkland to be enforced by Harbison or Smith or Jones or whoever. Let’s rely on the same corrupt City officials who SOLD PARKLAND to Lugliani to enforce the deeds.” Yeah, right, this makes a ton of sense. Corruption in PVE is far worse than even I thought. to be bereft of “common sense, fiscal responsibility [see 99.3% of property taxes going to police department], fairness, and … accountability and transparency,” to then claim “This enforcement authority is a role properly reserved for City government, guided by common sense, fiscal responsibility, fairness and, importantly, community accountability and transparency”. It became clear to the Coalition that started this website back in 2013 that Tony Dahlerbruch was a really, really bad guy. For all his efforts to garner (well deserved) sympathy for having a tragically and massively retarded son, Max Dahlerbruch (for whom our heart weeps), he flushes it all down the toilet with his corruption and unholy alliance with his job-getting buddy Christi Hogin. Maybe Dahlerbruch feels cheated by life and now is getting even on those more fortunate? What else can explain his shameless and disgusting breach of his fiduciary duty to all residents, whether he likes them or not? In our neighborhood, there is a serial law breaker named Desire Kocarslan. If you to http://605paseodelmar.com, you will she her history – it’s not a pretty sight. Yet this a-hole inept city manager Dahlerbruch not only lets her get away with breaking the law, but he and his code enforcement clowns Joseph Mendoza and Ellisa Hall don’t even know their own laws enough, or don’t care about enforcing them, to realize they were planning on issuing a permit for her to break the law again! I realize top business people don’t take public servant jobs like city manager or code enforcement officer, but this is not brain surgery. Disgusting, loser people in that building. I have been a resident of Palos Verdes Estates for about 53 years. and could see how the City Council would ignore the recommendations of the Planning Commission and thus because of the frustration I resigned. I am currently planning to initiate a taxpayers suit regarding the City of PVE for failure to take action against Municipal Code Violators. Oh really, Christi, in which certain respect did the lawsuit really just focus on one particular property? The judge said the deeds applied to entire PVE and she was making sure courts and residents would never waste resources again on another attempt to break the law! And which “forest” was “expense” for a tree, Christi? Do you really think we are all so bloody stupid as John Rea and Jim Goodhart? On July 01 I sent you the below email regarding the Final Ruling Summary Judgement in the sale of Public Parkland lawsuit! On July 02 the City posted the following malapropism to explain the verdict. In this case the malapropism is far beyond the use of an absurd or humorous misuse of a word as what was posted is far beyond that being a perspective designed to confuse perhaps even the council by whomever wrote it! I urge you to READ THE FINAL RULING and compare what you will find to what the City posted! I suggest if you do you will be much better informed to discuss the situation and make an informed decision as to whether or not to appeal – and to judge why such a obfuscating posting was written and posted. Do the right thing as the neutral elected representatives of the people. READ THE FINAL RULING before the July 14 closed session. ““The council will not have a chance to confer with the city attorney until July 14 …”???!!!!!!???? Let me understand this. This corrupt city attorney Christi Hogin, who Judge Meiers explicitly communicated had not been honest with the judge, who spearheaded an outrageously illegal multimillion 1.7 acre land deal, who was found through discovery to have been trying real hard to hide the true design of the illegal deal, who has reputational/ego and financial incentive to dig the city deeper into this hole — this is the person the city council is patiently awaiting to advise them on what to do next??? Is this some kind of joke? WAKE UP JOHN REA. WAKE UP JIM GOODHART. WAKE UP JIM VANDEVER. WAKE UP BETTY PETERSON. WAKE UP JENNIFER KING. YOU FOOLS CONTINUE TO ENTRUST OUR CITY WITH A VERY, VERY BAD AND DISHONEST PERSON. 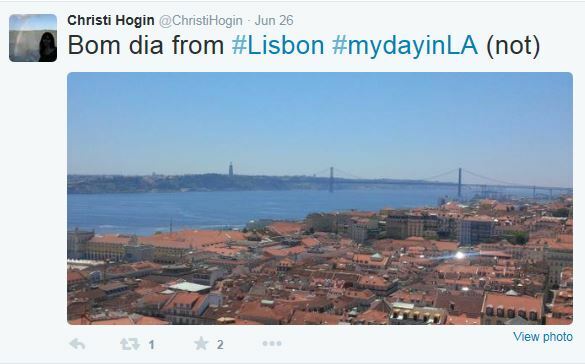 She’s out of the country on a vacation, tweeting from Portugal yesterday. Expensive vacation paid for from fees charged by her (self owned) firm to City of PVE for crooked work to set up and defend this illegal deal. Niiiiice !!!! So what’s going to happen…. I doubt anybody gets fired or recalled. Business as usual. PVE residents are either “newly wed” (i.e. younger families with two full time jobs, kids, and so many school & sports activities to have time to care) or “almost dead” (ancient PVE codgers who drive buicks or camrys at 20 mph down the street). Council knows this and that’s why they feel so comfortable having a farcical sham interview process just to put their loser insider attorney buddy Rea back on. I really hope the city will cut their losses and not pursue further litigation. There have been millions of dollars that have exchanged hands which will now be reversed, plus the city must pay for the attorney fees for the group suing the city. I am not a lawyer, but when an attorney advises an elected body who relies on her legal advice to enter into an illegal action, are there sanctions or possible actions such as disbarment? Shouldn’t she be responsible for all the costs expended by the city?? Why would they continue to take advice from her?? The City has been misdirected under the new city manager Tony, who has been involved with this from the beginning. I think the Councilmembers are actually well-meaning but have given their trust to an attorney and city manager who are incompetent. Tony managed all of 2 staff members in Rolling Hills before coming to PVE and is only there due to Hogin. She was chased out of Malibu and hopefully will lose her license to practice law. You are totally correct on the back room deal comment and should look at pveopenspace.com website, as I hope the State Bar will. Not sure I agree Marvin, but if we do take your premise on the face that the council members are basically honest, then they are totally INCOMPETENT. This boondogle never passed the “smell test” from day one and one wonders how these so called intelligent leaders (4 of 5 were attorneys themselves) did not even question this mess. Even the layman planning commissioners would not approve the zone change (funny – now 2 of those PC members are now council members). So the question remains… Council members… 1) Stupid ? 2) Crooked ? or 3) Stupid crooks ? It seems Marvin votes for the first and I vote for the last. As for Hogin I am sure we can agree on #2 and I wonder how somebody makes a complaint to the State Bar. I have a difficult time seeing how a well-intended council member could let this get so far. I agree with Arthur. Actions were totally unethical right from the stuff. I think they just thought they could all get away it. They did not count on the persistence and sense of justice of Mr. Harbison. Terrible mismanagement! It looks like PVE has been run more like a corrupt homeowners association than a city. ASK Sheri Repp Loadsman THE BASIS by which SHE decided that a city forester does not need a BS degree when every contractor and every professional association say that you do need a BS degree. Ask her why she thinks that PVE should pay twice what the professionals in the business say is the proper salary. OF COURSE – SHE KNOWS NOTHING AND THE PROPER ANSWER – FROM HER – IS “I don’t know what the proper salary and education is or should be. I suggest you conduct a salary survey. This is the professional way to handle this! Sheri Repp Loadsman, in my view, is corrupt and/or too lazy, not really caring about fulfilling her duty to the residents. Hearing horrible things about Dahlerbruch all over the place. The latest is that he has admitted in writing that he SHALL enforce the Muni Code selectively! Pretty much what others have been saying. This guy sounds as corrupt as a Chicago pol! !